Because of the mountainous terrain and large rainfall mosquitos that wash away the eggs & larve, they aren't particularly bothersome. Although there are a few nights out of the year where a large mosquito hatch occurs, normally they appear in small numbers around dusk for a few hours and hover near the floor. You can protect yourself with mosquito repellent applied to your ankles or by wearing socks & long pants in the early evening. Normally mosquito netting is not needed while sleeping. During the daytime you will see the occasional dengue mosquito (characterized by long white striped legs) but we have never had a dengue fever outbreak in the area. There are large American Crocodiles (Crocodylus acutus) in the Rio Rincon which is about 3 miles away. The males can grow up to 20' long but they are not known as man eaters although on occasion there are reports of attacks on humans. They rarely leave the river mouth and have never been seen near the beach at finca de nada. If you want to see them we can take you on a kayak tour of Rio Rincon. While most people adore spiders (after reading Charlotte's Web) there are a few people that have problems with them. They are plentiful in the tropics and at finca de nada. 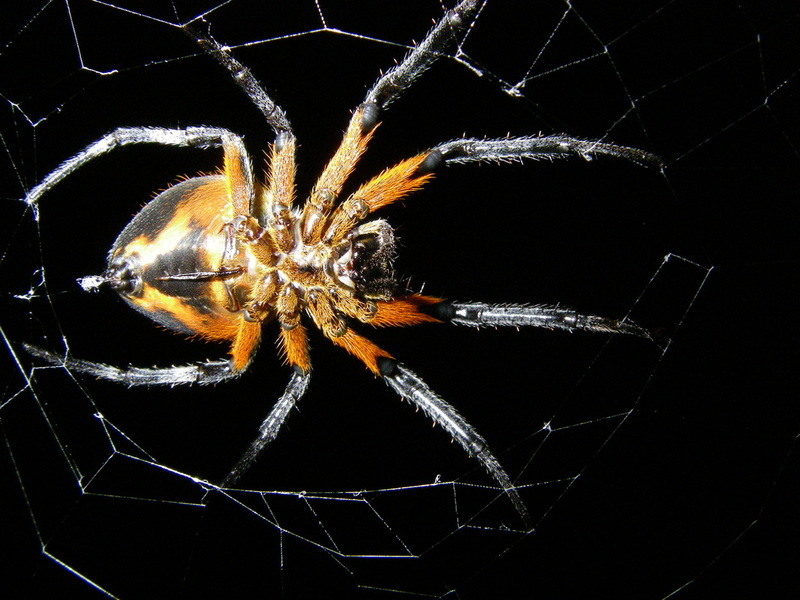 They do typically stay in their webs or are on the ground. Because the house is on an elevated platform we have very few spiders in the house. However, they are around and you are likely to encounter them. If you have arachnaphobia, finca de nada is not for you. There are very few dangerously venomous spiders in the world so apart from a itchy bump the consequences are minimal. Out of ~ 40,000 species of spider world-wide, only 12 are seriously venemous. We don't have Brown Recluse, Black Widow or Redback spiders at the finca. Yes, there are a few snakes at finca de nada. Most of the time you have to look for them and play with them to get bit. They don't chase you down and attack you. You have to step on them with bare feet or sandals to get bitten. 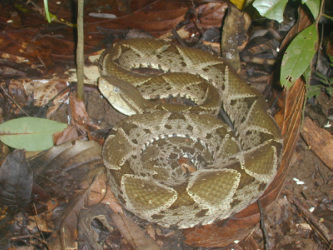 The snake that most people are concerned about is the Terciopelo (Bothrops asper) pit viper. Like the common rattlesnake it lies in wait to strike at mice and other small animals. The fatality rate in Costa Rica is close to 0% because antivenom is readily available in most communities and the venom is not a neurotoxin. Just to be safe, it is advisable to wear boots or covered shoes while walking around outside. They are not found on the beach or in the house which is on an elevated platform. While we have seen signs of Pumas ( Puma concolor; mountain lion, cougar, panther) at the finca we haven't see any sign of Jaguars though because we are near Corcovado park and they tend to have large ranges they may pass through the finca. There are a variety of other smaller cats on the finca such as the Ocelot, Margay, etc.. but none pose any hazard. The local legend is that Jaguars stalk and attack pregnant women to eat their babies. En Serio? There are wild Peccaries ( Pecari tajacu) at the finca and they do come down near the rancho from time to time in packs of 20 or so. There are cases where, if threatened, peccaries will chase down hikers. You can tell if a herd of peccaries are upset when you hear the clacking of their teeth. You can also tell when you are near a herd of peccaries in the woods by their noticeable stench. It is best to avoid them or at least not move towards them if encountered. There are stories of man-eating sharks in the Golfo Dulce but there has never been a documented case. We have never seen a shark in the Golfo Dulce other than Whale Sharks (which are filter feeders). We also frequently experience the phosphorescent plankton while swimming at night and have yet to be attacked. Coconuts can fall from the trees at any time and especially if the wind is blowing or a big storm is passing through. It is wise to avoid walking under coconut trees, especially at these times. If they hit you on the head they could kill or cause serious injury. Together with trying to open coconuts with a sharp machete, coconuts are probably the biggest danger at finca de nada.